Bramell, Party of Five: Let's compare! 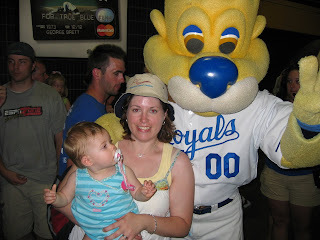 I looked back and found the photo we took with Slugger in 2008 to compare to this year's. Not much difference, really. Except that Becca let me stand a little closer to him last year. She is obviously not thrilled about him at all. Well, that and in the new picture, you can't tell that she is so scared that she's shaking. 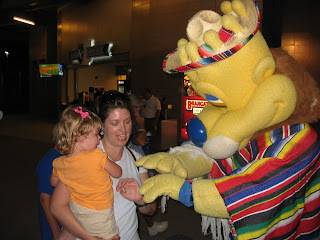 Along with Slugger, Strike and the Razorback, add to the list of "big costumed characters that scare Becca": Chuck E. Cheese. No pictures, but a big fit on Saturday when she saw him. Poor kid. chuckie cheese, which was then Showbiz pizza used to scare me too. those animatronic things are kinda creepy you gotta admit. You MUST stop traumatizing that girl! I bet if you laid them down in a row, she would step on all of them.....LOL! She'll let you know when she is ready for the characters to get up close to her. Hope to see y'all soon! They are creepy! She's the smart one!